Sedagive? and I started our latest diet two days ago. We didn’t do it because of a New Year’s Resolution, we did it because we were clear of holiday eating and I still have a week left at home before going back to the office. Mike Dolce is a former mixed martial artist and UFC fighter. He is currently the dietary coach of many UFC fighters, including Bigfoot Silva and champion Ronda Rousey. He helps athletes “cut” weight before a fight, and help them keep their bodies in top condition during training. 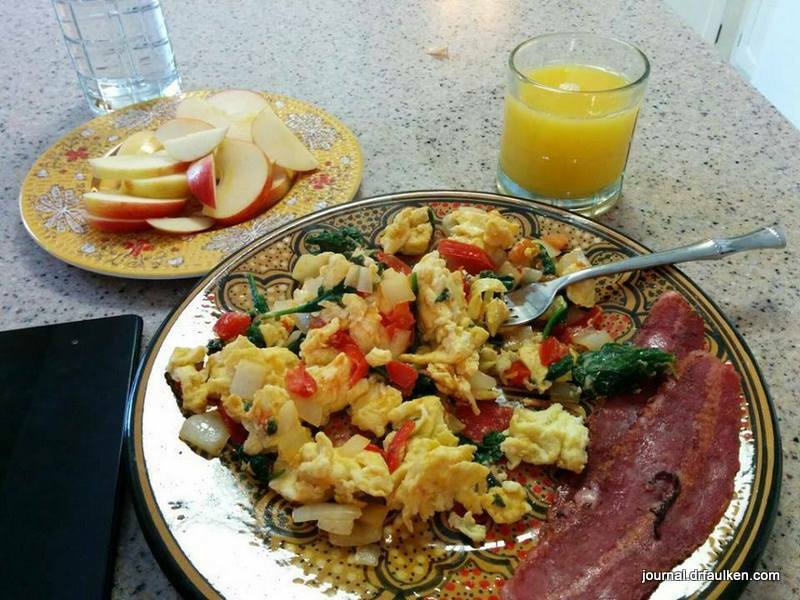 The Mike Dolce 21 day diet is very simple and is based on a reduction schedule. For example, for breakfast this morning we ate two eggs + two egg whites, a 12 ounce glass of orange juice (my first time having juice since probably 2003), a large fistful of spinach (which we prepared with our eggs), a half of a tomato, a half of an onion, two slices of turkey bacon (I refuse to call it bacon in real life, it’s “smoked turkey strips” to me) and a whole apple. It was super good. I ate four other times that day. Eating events ranged from a simple protein shake, a half cup of Craisins, and (another) apple to a spinach salad with a small portion of grilled chicken breast. Yesterday I ate more apples than I normally do in three days. We’ll see how it goes! I’m excited to try this, and I haven’t eaten such a regimented diet before. I know it’s temporary, and we intend to eat the types of foods recommended in Dolce’s larger tomes after our 21 day session. Between this and the 10,000 Kettlebell Swing challenge I hope to lose about 10 – 15 pounds of fat before it’s all said and done.